Rebellion Photonics, a Houston-based continuous monitoring company that leverages visual monitoring systems, advanced analytics and machine learning to find and characterize methane leaks, is a prime example of the global potential for innovative methane monitoring solutions. With over 40 systems deployed in nearly half a dozen countries, Rebellion is a proof point for how demand for solutions to the world’s methane challenge exists across the globe and throughout the oil and gas value chain. We already know up to 50 percent of oil and gas methane emissions could be cut at no net cost, but some technologies are making it even easier and less expensive for companies to prevent methane leaks in the first place. Clarke Valve has developed an innovative valve that is half the price of its competitors and emits 25 times less methane. Keeping that much more product in the pipeline can help companies boost their environmental performance and economic efficiency. These types of innovative strategies to stop wasted methane are a win-win. Because methane is a saleable product, managing emissions and driving operational performance are in many cases one-in-the-same. With sophisticated algorithms and artificial intelligence, Kelvin Inc. is harvesting patterns from the oilfield and turning them into predictions to drive efficiencies and cut emissions. In one BP case study, Kelvin’s algorithms helped cut methane venting events 74 percent, costs by 22 percent, and increase production volumes 20 percent. A major part of what makes this sort of improvement possible is data. As noted by Kelvin CEO Peter Harding, “First you learn, and then you have the knowledge with which to act.” Intelligent control systems require high quality inputs to deliver high quality outputs. In other words, you’re only as good as your data. Acquiring the type of data that make programs like Kelvin’s possible represents an opportunity area in the progress toward validated low/no emissions facilities. Accurate and verifiable data is critical for oil and gas companies’ social license to operate, and is doubly crucial as input for the digitization, automation, and prediction solutions that can increase performance. However, as recent research has shown and EDF’s Mark Brownstein made clear at Venture Day, “there is undercounting going on just about everywhere you go” when it comes to methane emissions. This underscores the need for reliable data to not just feed operational advances, but fact check progress made in methane solutions. Although technologies like drones, robots, and blockchain have a certain “wow” factor, sometimes what industry really needs are the types of solutions that solve systemic, industry-wide challenges. SAF Cell creates cost-effective hardware that can safely and securely power electronic equipment at oil and gas sites – that means powering electric actuators and sensor networks in far-flung and remote locations. The widespread agreement in the Venture Day conference room that oilfield electrification is a priority points to the fact that practical solutions to fulfill basic needs certainly have a key role to play in the oil and gas industry. As Venture Day winners are announced later this year, we hope to see investment in solutions that not only detect existing leaks but prevent leaks from occurring in the first place. 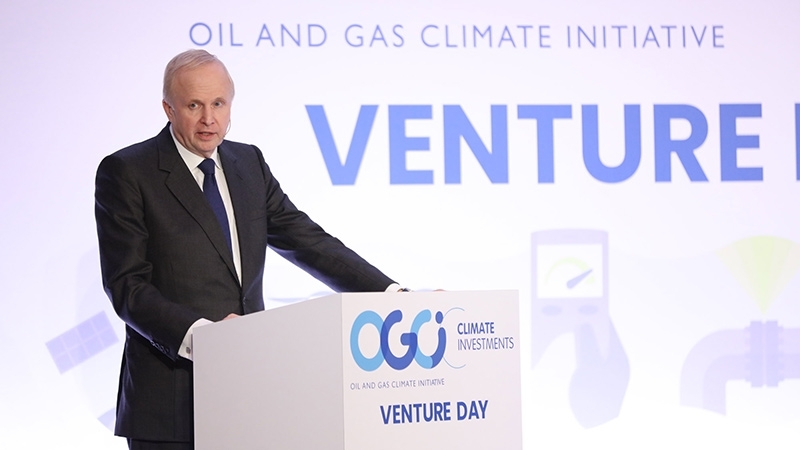 And as the innovative technologies on display at Venture Day are piloted, it’s vital that insights from their real-world testing and global deployment are shared beyond OGCI members to expand the scope and scale of progress being made on methane emissions.